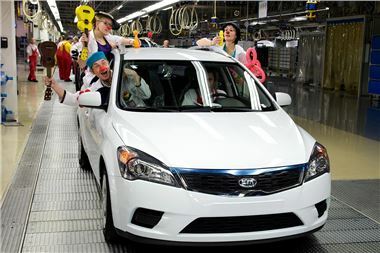 Kia Motors produced a record 252,000 cars at its Zilina, Slovakia factory last year - a 10 per cent increase over 2010. The plant also achieved a 12 per cent year-on-year increase in engine production, with more than 359,000 petrol and diesel engines rolling off the production lines in 2011. In just over five years since production started Kia Motors Manufacturing Slovakia has built its 1,000,000th car - a white, diesel-engined cee'd SW. Immediately handed over to a Slovakian children's charity - the Red Nose Clowndoctors - the cee'd is also the 600,000th version of the Zilina factory's first car. The factory now also produces Sportage and Venga. "Kia Motors Slovakia has achieved an important milestone in its history with the production of the millionth car. We decided to donate it to an organisation which will bring pleasure to children during their stay in hospitals," said Eek-Hee Lee, President and CEO of Kia Motors Slovakia. Kia Motors Slovakia recorded a 10% year-on-year increase in car production and a 12% year-on-year increase in engine production during 2011, when it produced more than 252,000 cars and 359,000 engines. The factory plans to produce around 285,000 cars this year. Sportage production in 2011 topped 101,000 units, representing 40% of the overall production. A total of 103,000 cee'd models were produced, or 41% of the total production and 11,000 Kia Venga models. The remainder of 2011 production, 36,000 units, were Hyundai ix35 manufactured up to June 2011. Kia Motors Slovakia launched a third shift this year and increased the number of employees to 3,900. The company is currently preparing for production of the second generation of the cee'd model during the second quarter. With the opening of a second engine shop last year, maximum engine production at Zilina has increased to 450,000 per year. To meet increasing demand and the transferred production of Venga, Kia currently employs more than 3,900 people at Zilina and is planning to raise output in Slovakia even further, aiming to produce 285,000 vehicles this year.